Many people disregard the importance of baby teeth due to their temporary nature. However, baby teeth serve some very valuable functions for children by aiding in their health and development. What are baby teeth needed for? At what time do baby teeth come in? Children’s teeth start forming before birth. The teething process usually begins in infants between 6-10 months of age. Between this time, the first lower center primary teeth emerge from the gums. Although all twenty baby teeth typically appear by age three, the order and speed differs between individuals. By age six, children’s permanent teeth begin to appear. This process continues until about the age of 21, when the wisdom teeth emerge if jaw space permits. The incisors, or front teeth, are generally lost between the ages of 6-8. Around age 9-13, children lose their back teeth (canines and molars). Begin cleaning your baby’s mouth during the first few days after birth by wiping the gums with a clean, moist gauze pad or washcloth. As soon as teeth appear, decay can occur if you do not clean your child’s mouth thoroughly. One form of serious tooth decay found in infants and toddlers is called “baby bottle tooth decay”. This is caused by frequent exposure to liquids that contain sugar (milk, breast milk, formula, fruit juice). These sugary liquids can pool around your child’s teeth, causing plaque and bacteria to build up. Start brushing your child’s teeth with fluoride toothpaste as soon as they begin to emerge. Brush teeth thoroughly twice per day, or as directed by your Longmeadow dentist. 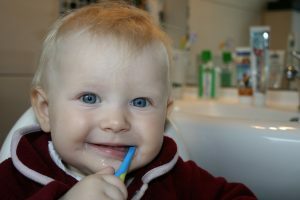 Starting infant’s off with proper oral care will help protect their teeth for decades to come. If you have questions about how to care for your baby’s teeth or wish to bring your child in for a checkup, make an appointment with your Longmeadow dentist today.